The team will describe their approach in one of more than 9,000 presentations at the 250th National Meeting & Exposition of the American Chemical Society (ACS). Mosquitoes and other insects remain a pesky part of everyday life in many parts of the world, and their bites are linked to a range of serious diseases, such as malaria. To add to the arsenal of insect repellents, Charles Cantrell, Ph.D., investigates the components of plants used in traditional therapies. "We found that in our search for new insect repellents, folk remedies have provided good leads." Sweetgrass is a meadow grass that is a native to northern climates, Cantrell says. "It gives off a sweet aroma that repels mosquitoes." He therefore suspected that the active insect-repelling chemicals must waft off sweetgrass at ambient temperatures and, like essential oils from lavender and other plants, could be extracted using a process known as steam distillation. This method involves passing hot steam through plant material, then lowering the temperature. The condensed liquid then separates into oil and water, with the oil fraction containing the volatile chemicals of interest. So, Cantrell's team at the U.S. Department of Agriculture, in collaboration with researchers at the University of Guelph and the University of Mississippi, performed steam distillation on sweetgrass samples and evaluated its oil for the ability to deter mosquitoes from biting. To test the mosquitoes' aversion to the oil, the researchers filled small vials with a red-colored feeding solution that mimicked human blood and covered the vials with a thin membrane. Then, they coated the membranes with different substances: the sweetgrass oil, alternative sweetgrass extracts obtained without steam distillation, the gold-standard insect repellent N,N-diethyl-m-toluamide (DEET) or the ethanol solvent control. Then, the bugs got the chance to either bite the membranes to get to the blood or pass them by. The researchers observed what the insects did, counting how many mosquitoes went for a bite of each type of "blood" vat. "Then you take the mosquitoes and squish them on some paper," says Cantrell. "If they have the blood mimic in them, you see it right there on the paper." Of the sweetgrass extracts, the steam-distilled oil got the fewest mosquito bites, matching the repellent potency of DEET. The next step was to figure out the exact chemicals that give the sweetgrass oil its anti-mosquito power. The researchers purified the oil into 12 fractions and again checked their ability to ward off the bugs. They found three fractions that repelled mosquitoes as well as the oil. Using nuclear magnetic resonance (NMR) spectroscopy and mass spectrometry, the researchers identified two chemicals in these active fractions that seemed to be responsible for putting off mosquitoes: phytol and coumarin. Coumarin is an ingredient in some commercial anti-mosquito products, he adds, while phytol is reported to have repelling activity in the scientific literature. So although Cantrell didn't find brand-new insect deterrents in this experiment, he is happy to have demonstrated that "we were able to find constituents that are known to act as insect repellents in a folk remedy, and now we understand that there's a real scientific basis to this folklore." 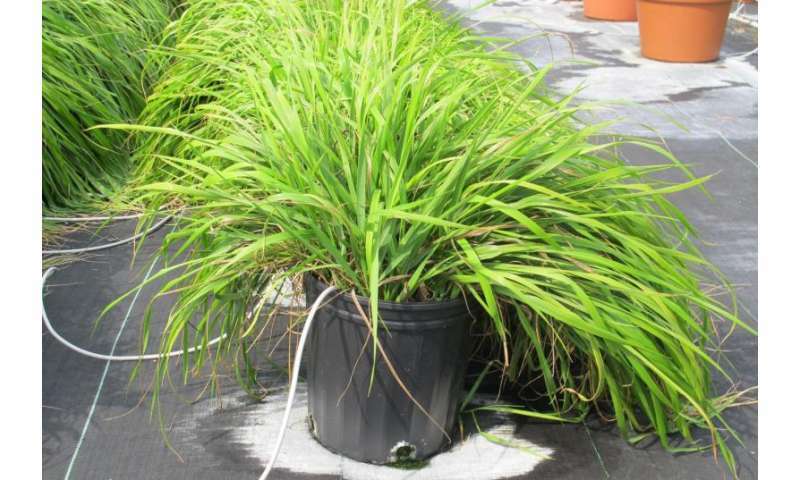 More information: Isolation and Identification of Potential Biopesticidal Compounds from the North American Insect Repelling Folk Remedy Plant, Sweetgrass, Hierochloe odorata (L.) P. Beauv. the 250th National Meeting & Exposition of the American Chemical Society (ACS).